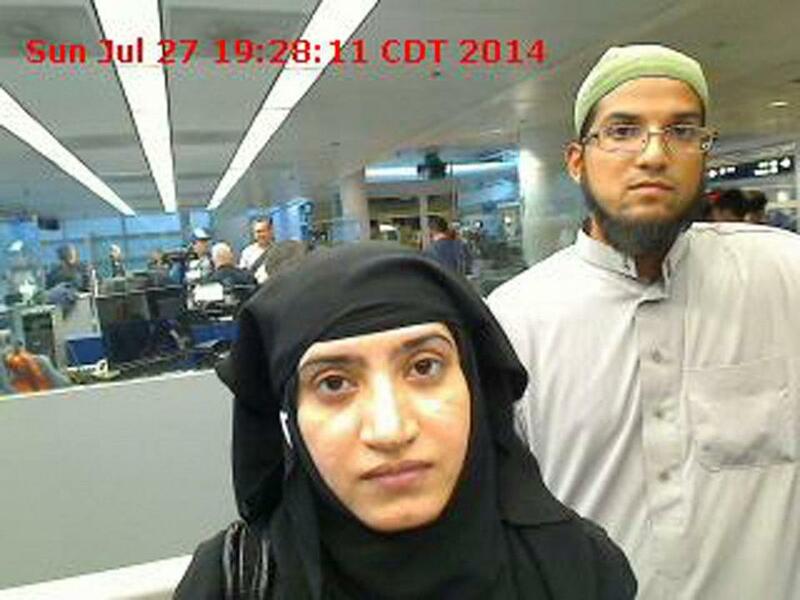 Tashfeen Malik (left) and Syed Rizwan Farook moved through customs at O’Hare International Airport in Chicago last year. WASHINGTON — FBI Director James Comey says the two San Bernardino, California shooters were radicalized at least two years ago and had discussed jihad and martyrdom as early as 2013. Comey told the Senate Judiciary Committee on Wednesday that Syed Rizwan Farook and his wife, Tashfeen Malik, were radicalized even before they met online. The couple wed last year. He said the investigation is continuing. Farook and Malik had gone undetected while planning the massacre that included amassing thousands of rounds of ammunition, high-powered guns and pipe bombs. The FBI’s acknowledgement that the San Bernardino shooters had been radicalized Muslims for ‘‘quite some time’’ points to the difficulty discovering potential terrorists who keep a very low profile and shows the deadly consequences that can occur when identification comes too late. The couple, who lived quietly in a two-bedroom townhouse with their 6-month-old daughter and Farook’s mother, had not come to the attention of law enforcement before clothing themselves in black, donning face masks and bursting into an annual festive meeting of Farook’s county health department colleagues with guns blazing. They killed 14 people and wounded 21 last Wednesday before dying in a shootout with police about four hours later. David Bowdich, chief of the FBI’s Los Angeles office, told reporters the agency was searching for how and where radicalization occurred and who might have led them to those beliefs. Investigators believe Malik radicalized before meeting Farook, FBI spokeswoman Laura Eimiller said Tuesday, though she didn’t elaborate on what led the FBI to that conclusion. Farook, 28, a restaurant inspector born in the U.S. to a Pakistani family, radicalized before Malik, 29, emigrated to the U.S. from Pakistan in July 2014 on a fiancée visa and married him the next month. America’s counterterrorism infrastructure has had success flagging individuals who try to travel abroad to fight alongside militants, fund operations overseas or who communicate online with overseas terrorists. But it’s been far more challenging for law enforcement to identify each and every individual who self-radicalizes online, a process the Islamic State has facilitated with slick Internet propaganda aimed at the disaffected. ‘‘They’re not communicating with a terrorist organization, they’re not doing those other things that we have typically looked for when we’re looking for terrorists,’’ said John Cohen, a former Homeland Security Department counterterrorism coordinator. Behavior in isolation isn’t likely to put a defendant on law enforcement’s radar. But sudden withdrawal from friends or family, for instance, starts hitting trip wires when combined with other actions, such as increased visits to hate-spewing chat rooms or radical change in appearance. Even then, law enforcement is challenged on a daily basis in separating individuals who hold radical views, which in and of itself is not a crime, from those who are plotting acts of violence or encouraging others in that direction. Mike German, a national security fellow at New York University Law School and a former FBI agent, said the government’s model to predict who will become a terrorist is flawed, partly because it focuses too much on those who adhere to a radical or extreme ideology. The Obama administration, mindful of the problem, has created an initiative called Countering Violent Extremism that encourages communities to steer vulnerable young adults away from radicalization, though it’s unclear how successful that effort is. FBI agents currently have hundreds of open inquiries in all 50 states related to terrorist ideology. When they identify someone they think is predisposed to violence, they’ve turned to a range of techniques — including sting operations involving informants and inoperable weapons and placing undercover agents in chat rooms — as part of their investigation. They’re nonetheless constrained under Justice Department regulations in the investigative steps they may take. That guidance, known as the Domestic Investigations and Operations Guide, permits agents to check out a citizen’s suspicion even when there’s minimal factual basis for doing so. Actually opening a full-blown investigation, and using tools such as surveillance and phone wiretaps, requires a significantly higher burden of evidence of wrongdoing. So far, the FBI has revealed little of what it’s learned about Farook and Malik and their planning, except for details about the weaponry they had, materials they had to make more pipe bombs and that both had been taking target practice. Malik also practiced at Riverside Magnum Range, where Farook shot at targets two days before the attack, Eimiller said. Investigators also are trying to determine a money trail for funding of the operation. A U.S. official said Tuesday authorities are looking into a deposit made to Farook’s bank account prior to the shooting. The official, who had been briefed on the investigation but was not authorized to discuss it by name and spoke on condition of anonymity, would not further characterize the nature of the deposit or what was suspicious about it. Hughes said the FBI surely is looking to see what red flags law enforcement might have been missed — part of a post-mortem analysis that follows every incident of this nature. ‘‘What do you learn from this, and how do you mitigate the next attack?’’ he asked.